We got our hands on some of the newest and best rangefinders out there and ran them through the paces for your reading enjoyment. Probably the most-talked-about new product at this year’s Archery Trade Association show in January, the Vendetta piqued our interest and we were eager to give it a try. Mounted to the bow’s riser, above the sight, the Vendetta works by aligning your sight’s top pin with the target and squeezing a pressure pad mounted on your bow’s grip. It allows you to range a target while at full draw, minimizing game-spooking movement and time spent. If you keep pressing the pad, the unit will continually adjust distance, angles, and elevation as your target moves. Measurements automatically factor in incline/decline, distance to target, and bow-specific ballistics to provide the equivalent horizontal distance for precise shooting on an incline. Maximum range is 70 yards; minimum is 10. A large LED display has a red filter that makes it easy to see distance readings in various light conditions. The Vendetta features a durable polycarbonate body and a sturdy aluminum mount that easily adjusts left and right, and up and down. The ball joint allows for further fine-tuning when mounting. The CR2 lithium battery provides thousands of activations to last through even long seasons. Here’s how it works: You start by bolting the mount to your sight bracket and using two rails to bring the unit around back to the other side of the riser, where it suspends at the top of your sight window. Then attach the activation switch to the front of the grip where you can easily reach it with a finger. Next step is to align the laser with your top pin. Leupold provides an alignment target, which you set up 20 yards or more away. You set the rangefinder on alignment mode, which projects a red dot on the target; when both the sight pin and dot converge on the target, you’re ready to rock. One of the first things I noticed about the setup is that it pretty much requires you to be at full draw to take a reading. I had assumed you could get a reading by simply holding the pin up to the target without drawing, but I found most situations require more precision than you can get that way. I shot targets at a variety of ranges and found the Vendetta to be reliable and precise. It does change the way your bow handles, making it a bit more top-heavy (the unit and mounting hardware weigh 10 ounces). I noticed that with my shooting style, having the Vendetta mounted caused my top limb to tend to fall backward at the shot. That is probably why the bow (a Mathews DXT) shot 3 or 4 inches higher with the unit mounted than without. I also noticed my groups seemed to be tighter with the Vendetta mounted, which makes sense as extra weight has a stabilizing effect. I experimented by attaching the largest stabilizer I could find to offset the top-heaviness, and found that point of impact was somewhat corrected and my groups got even smaller, though the setup resulted in a bow heavier than I really care to use. A couple other things I noticed is that maintaining good form with the grip hand can be a challenge when operating the switch. Also, it occurred to me that the Vendetta will not work with a moveable sight—unless perhaps the user got really creative and came up with some other way of aligning the laser on the target. 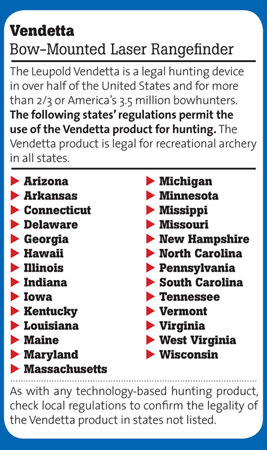 These are all factors to consider when contemplating purchase of a Vendetta. There are two others: Whether it is legal where you hunt (see sidebar) and the fact that it can do something no other rangefinder can, which is to give you a precise reading precisely at the moment of truth, which could very well be the difference between bagging an animal and not. 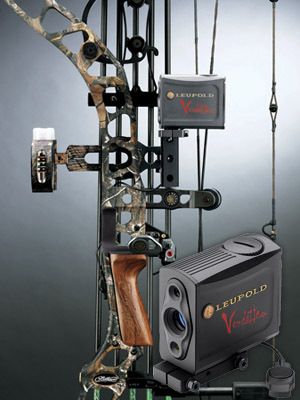 Here is a link to the Leupold TV video that demonstrates the installation and alignment of the Vendetta. Most all bowhunting accessories can be made better by making them lighter and more compact. The pocket-sized, ergonomic BowHunter scores well in both these critical areas, and in another: increased bowhunter-friendly features. The big one is the built-in digital inclinometer, which measures angles from -90 to +90 degrees, with +/- 1-degree accuracy. So while in "Bow Mode," even if you find yourself in steep terrain that can handicap lesser rangefinders, this nifty unit will provide the true horizontal distance to your target—the measurement that really counts when selecting the right sight pin—from 5 to 99 yards. Maximum range is 800 yards. I found the nominal 4x viewfinder adequate for most bowhunting conditions including treestanding and other shorter-range work, where greatly increased magnification can actually work against you, slightly delaying target acquisition when speed is most critical. One area the BowHunter seemed to struggle was in operation through obstacles/brush. Personally, I haven’t found this to be a critical factor, as I can't remember not being able to range an animal I thought I could or should range. However, this is yet another example of why these Field Tests are so valuable. 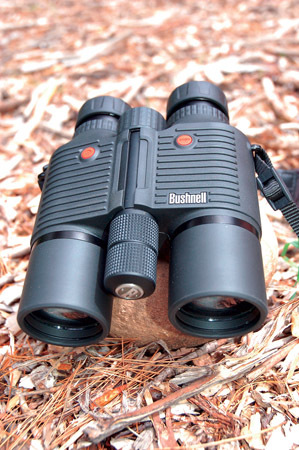 If I hadn’t experienced the extreme power of the Bushnell Fusion through the very same obstacles, very likely I would never have realized what was possible. There’s lots to like about this lightweight, compact design, including a nice and powerful laser that offered lightning-quick readouts through thick glass windows, as well as through chicken-wire-type fencing and light brush. So of the three units I put through my own "through-the-brush" tests, the RX-750 finished a strong second, bowing only to the freaky-strong Bushnell Fusion while outperforming the Bushnell BowHunter, which failed to give a reading through glass or the wire. But the real neat thing about this unit is its True Ballistic Range capability—cutting-edge technology that uses a built-in inclinometer to provide true ballistic range (rather than straight-line distance) to the target. Included are three archery and seven rifle ballistics settings that make it quick and easy to place shots with consistent accuracy even in tricky steep, mountainous terrain or from high treestands. Bowhunters simply need to enter the setting that matches their equipment ("A" for bows shooting less than 215 fps, typically bows less than 50 pounds; “B” for bows shooting 215-250 fps, typically 50-60-pound bows, and "C" for high-performance bows shooting 250 fps or more). Included in the case is a handy reference card that details all this, which is actually more useful for the gun settings, but it’s nice to have. I liked the impressively bright, clear, 6X optics, again falling between the two others I tested but to my eyes an ideal “all-around” magnification for a dedicated rangefinder. 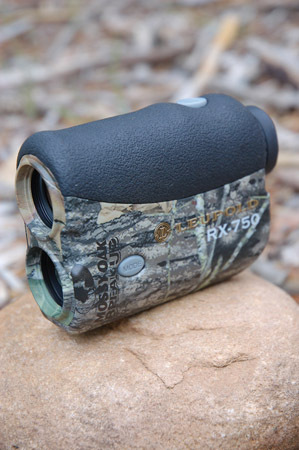 Leupold's been turning out rangefinders for a while now and it shows; the RX-750's compact design, about the same size and weight as Bushnell’s BowHunter, includes a smart, ergonomic, rubber-coated top that offers a positive grip even in wet conditions. And the included black nylon carry case offers multiple attachments (belt loop and swivel hook) and a silent, bowhunter-friendly hook-and-loop closure. There’s even a special side pocket for an extra battery that dedicated rangefinder users should never be without. Smart again. 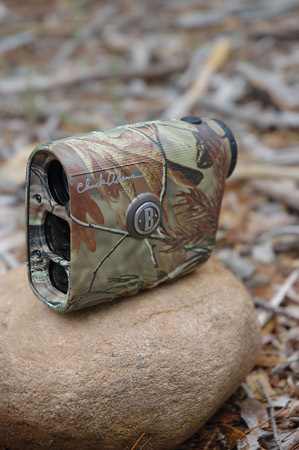 Western and open-country bowhunters, especially, need to take a look at this fine two-in-one, bino-and-rangefinder unit. The reasons are many. Number one is optic quality; the crisp, clear, bright 10x picture (which you can custom-tweak with dual diopter adjustments) is stand-out sharp–truly worthy of recognition as a bino alone. Throw in the rangefinding feature that works out to 1,600 yards and you almost feel spoiled. Personally, I’ve never been a fan of “combo” units in the past, mainly due to increased size and weight, but this unit changed my mind. This one isn’t much larger or heavier (31 ounces) than other premium 10x42mm binos. And it certainly doesn’t hurt that the "rangefinding" performance is, in a word, incredible. Cool enough is the nice and bright, red LED readout that was easily visible in bright sun, and maybe as good as it gets in low-light conditions—easily easier to read in these conditions when compared to units offering black readouts. This latest in Nikon’s ever-evolving line of rangefinders is their best offering to date, with several features of particular benefit to bowhunters. At first examination the Archer’s Choice is a quality and advanced piece of electronics. It features ID (incline/decline) Technology, Nikon’s proprietary approach to compensating for up and down shooting angles. The unit may be operated in one of two modes: standard mode, which will measure actual distance, and the ID mode, which compensates for angle (indicating a closer angle than actually to compensate for how an arrow will hit higher if shot at an uphill or downhill angle). The unit will read yardages out to 100 yards and closer than most other rangefinders, all the way down to about 4 yards in fractional increments of .2 or .5, depending on the mode. I like that the unit is in 6-power magnification. That, combined with Nikon’s famous super-sharp optics, gives me the option to leave binoculars behind in cases where they might be a burden. 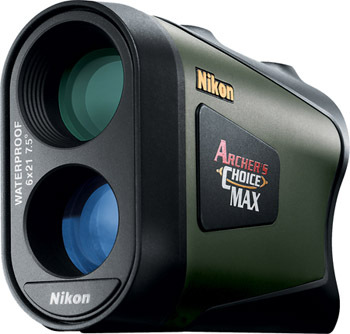 The many features of the Archer’s Choice include waterproof/fogproof construction; a focusing eyepiece; eyepiece cups to allow for use with or without glasses; tool-free battery compartment cover; lanyard attachment ring and lanyard; soft rubber coating on the shell; and a padded case that can stay on in use in Realtree APG. Operation is simple; one button switches between the two modes, and the other turns the unit on and measures distance with each additional click. Holding the button down allows the user to continuously scan distances. The unit turns off automatically after about eight seconds of nonuse. For my test, I first measured several angles and distances in both modes. As expected, the unit indicated a higher degree of compensation for greater angles and distances. With a pretty average compound bow setup, I did a lot of shooting at different modes and angles with my test unit. I found that not only did this rangefinder provide more accurate shooting than I got with a non-compensating rangefinder; the results were surprisingly precise.